As I write rain is falling here in Fingal. 8.2mm has fallen in the past 4 hours. The first significant rain that we’ve had here since early May. Like many, I have have been enjoying the sunny days and the warm evenings, eating dinner al fresco. However, I’ve been fighting troubling thoughts that stem from my keen interest in the weather and my work in the horticulture industry. 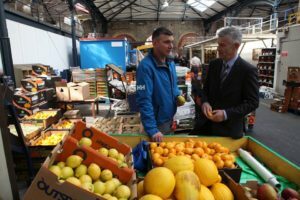 As Coordinator of the Horticulture Industry Forum, I have been working with stakeholders across the industry to stabilise our capacity to grow fruit and vegetables in Ireland. There are now just 165 commercial vegetable growers left in Ireland compared with 377 in 1997. Over the past decade, the remaining growers have managed to keep growing, more or less, the same amount of vegetables. Five major supermarkets control 90% of the Irish retail market and the high level of competition between them has led to growers obtaining prices that just cover or fail to cover their growing costs. As a result, many growers have not been able to re-invest, care for their soils and put money away for the “rainy day”. Ireland is noted for it’s mild and benign climate. Nothing extreme happens here… Storm Ophelia, Storm Emma and now the most severe drought since 1976 have all occurred in the past eight months. Growers have been now working for weeks to try and save their crops. This has entailed boring new wells and working long hours, often through the night to irrigate plants. Despite these efforts, there will be a large drop in the volume of fresh produce harvested in Ireland this year. This has serious consequences. We will lose many growers who will just not survive. For example, we have just four commercial carrot growers left in Ireland and the loss of just one of these will cause a serious drop in output of one of our biggest lines of domestically grown crops. 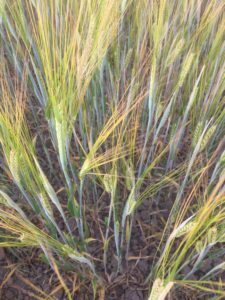 Growers survived in 1976 so why won’t they survive now? The drought in 1976 was severe but it was different. This was the only severe weather event that year and in those days when yields fell, growers earned more as the vegetable market delivered higher prices for the crops that did survive. Growers now tender months in advance and supermarkets pay just that price. More worrying is the broader picture. In 1976, Ireland and Britain were just one of three regions where temperatures were significantly above normal. Food production in many other place across the world were not affected. 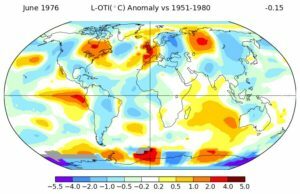 A cursory glance at the difference in world temperature anomalies between 1976 and 2018 shows the extent of the severe conditions occurring across the globe. This will undoubtedly have significant impacts on food production not just in Ireland but in other major food producing countries. In the past, when crops have performed poorly here our retailers have turned to imports to ensure that the shelves are filled. During Storm Emma, there was a short period when the shelves were not full. I suspect our retailers will find it more difficult to source their supplies of fruit and vegetables over the coming months. 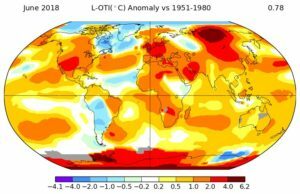 We will survive for now but what is really troubling me, as a world weather observer, is the apparent increase in the rate of change in world weather patterns and rate of temperature rises. These will make it ever more difficult and risky for growers to produce the food we require. As an island nation, we are particularly vulnerable to food supply shocks. As a country, we need to wake up to the growing challenges to our national food security and put in place policies to ensure that as a country we will be able to feed ourselves. We can start by keeping the growers we have in business by actively looking for and buying Irish fresh produce.